System designed to maximise the safety of the occupants (with the exception of the rear centre passenger) in the event of violent collisions. 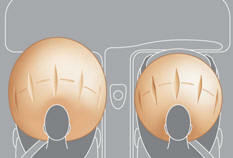 The airbags supplement the action of the force-limiting seat belts (with the exception of the rear centre passenger). - in the case of a minor or rear impact or in certain roll-over conditions, the airbags will not be deployed; the seat belt alone contributes towards ensuring your protection in these situations. This equipment will only deploy once. If a second impact occurs (during the same or a subsequent accident), the airbag will not be deployed again. Deployment of the airbag(s) is accompanied by a slight emission of smoke and a noise, due to the activation of the pyrotechnic cartridge incorporated in the system. Only the passenger's front airbag can be deactivated. 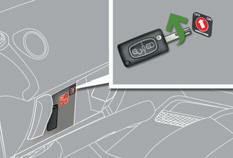 With the ignition off , insert the key in the passenger airbag deactivation switch. Turn it to the "OFF" position. If these warning lamps come on or fl ash, accompanied by an audible warning and a message in the screen, contact a PEUGEOT dealer or a qualified workshop to have the system checked. Each lateral airbag is fitted in the front, in the outer side of the seat back frame. 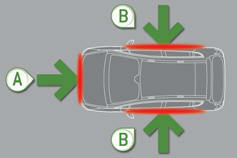 The lateral airbag inflates between the front occupant of the vehicle and the corresponding door panel. Even if all of the precautions mentioned are observed, a risk of injury or of minor burns to the head, chest or arms when an airbag is deployed cannot be ruled out. The bag inflates almost instantly (within a few milliseconds) then defl ates within the same time discharging the hot gas via openings provided for this purpose. 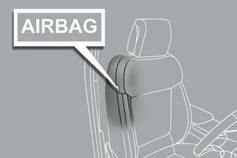 Use only approved covers on the seats, compatible with the deployment the lateral airbags. For information on the range of seat covers suitable for your vehicle, you can contact a PEUGEOT dealer. Refer to the "Accessories" section. Do not fi x or attach anything to the roof. This could cause injury to the head if the curtain airbag is deployed.